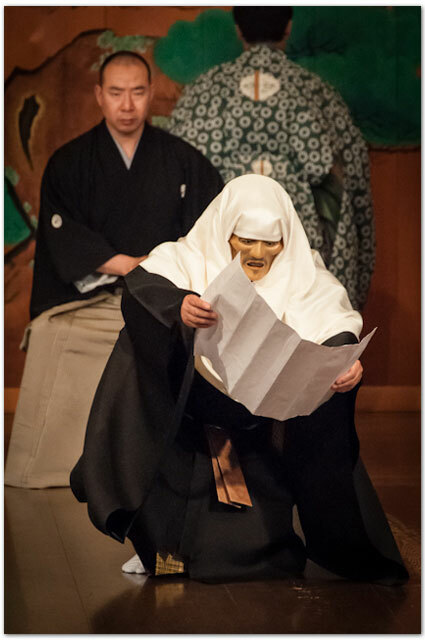 So goes another successful “kneeling” as I emerge from working backstage at the Oshima Noh Theatre in Fukuyama. Each time I am granted access to work with such master artists, I am literally almost humbled to tears. The wealth of generosity on display transmitted from master to apprentice with both tender encouragement and stern rebuke is inspiring to witness. 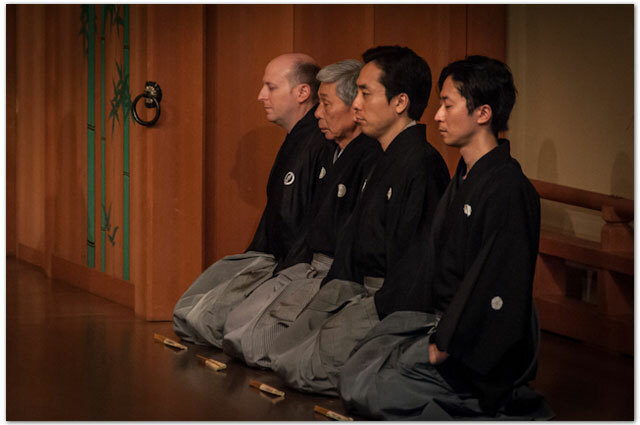 I was invited to sing in the chorus for Oshima Kinue as she performed the noh Kakitsubata. It was quite a challenge as the last time I had worked with the piece was more than 10 years ago. After the invitation, I received lessons from my teacher in Tokyo, Omura Sadamu, so I was well prepared, but having little more than just over a month to memorize the piece was a daunting task. Even if I was a native Japanese speaker, which I am most certainly not, memorizing the highly poetic text in the classic grammatical structure would pose a challenge. The job of the chorus member is to support the ji-gashira (chorus leader,) which in this case was Kinue’s father Oshima Masanobu. He navigated the delicacy of the 85-minute piece through gentle vocal pulling and pushing with a sensitivity I’ve have come to expect from him. To his right was the fuku ji-gashira, or vice-chorus leader, Nagashima Shigeru whose power augmented Masanobu’s nuance to help drive the beautiful melodious train I was happy to be riding. The hayashi (instrumentalists) included one of the brightest shining stars of the younger generation of Morita school flautists Sugi Shintaro, as well as the brother-brother team of Taniguchi Masatoshi and Narita Natsushi. Sitting on one’s knees over the 1 hour mark tends to be an exercise in endurance and I am truly indebted to the hayashi’s power for helping me get lost in their euphonious diversions as the pain in my lower extremities vied achingly for my attention. The balance between the dai-sho (the two hand drums who sit at the back of the stage) and the chorus was really wonderful. At a reception following the day’s program I was complimenting Taniguchi-san about this and while he was appreciative, he made note that he knows his brother’s playing so well, they basically share one brain. So while the balance between their kakegoe (drum calls) and drum hits may sound great for the audience, he occasionally gets a tad bored as he knows exactly what his brother is going to do before he does it. I assured him that his boredom was my bliss and this evoked a wry smile. In my younger years, when I would perform “the rock music,” post performance I often found myself completely depleted of energy having “left it all on the stage.” I find that after noh performances however, due to the considered support with which all those involved share, I find myself in a heightened state of awareness, tired, but not the least bit fatigued. As icing on the day’s cake, when it came time to stand and leave the stage, my legs cooperated completely and it was the first time in Fukuyama I didn’t wobble up and hobble off. While this may sound inconsequential, to me it was a triumph. I was actually a little surprised at the number of audience members who commented to me afterwards how well I did standing, which proved to me that such seemingly minor details do not go unnoticed. I hope it means I’ve turned a corner with regards to my sitting and that it wasn’t just a fluke. 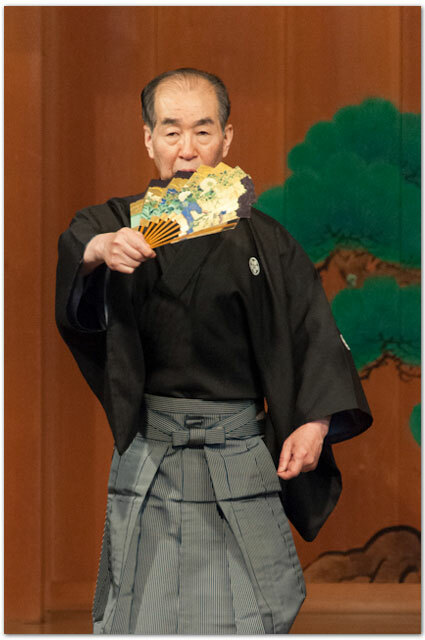 For the cherry on top of the aforementioned icing, Oshima Masanobu honored my by playing the DVD of an English language performance of Sumida River I was a part of back in 2009 on the TV in the dressing room. As the shite performers were getting ready for the day’s events they were intrigued by the DVD as the tried to follow along with the English as they know the piece so well in Japanese. Richard Emmert had translated the piece and matched the syllabic structure of the English so that it fit in perfectly with the instrumentation of the traditional piece as it is played in Japanese. The Kita School performer Kaneko Kyoichi who was performing the main role in Kikaigashima or Shunkan that day, took the time to watch a fair amount of it and impart some very kind words regarding my performance. I was duly flattered, and instantly deferred the compliment to my teachers for that piece Matsui Akira, Oshima Kinue and musical direction from Richard Emmert. As I was backstage for Kaneko-sensei’s performance, I was only able to watch through the curtain, but even from there I could feel the nobility he instilled in the desperate pleas of the exiled Shunkan. Joining him on stage as his tsure (accompanying performers), were none other than his son and grandson representing three generations of Kanekos on the stage. The irony of the patriarch, representing Shunkan being abandoned on by two generations of his offspring on none other than father’s day was not lost on me. As a Western performer, I wondered if he had “used that” in his portrayal of the tortured soul that is Shunkan, but when I inquired about this to other performers, it had not occurred to them at all. 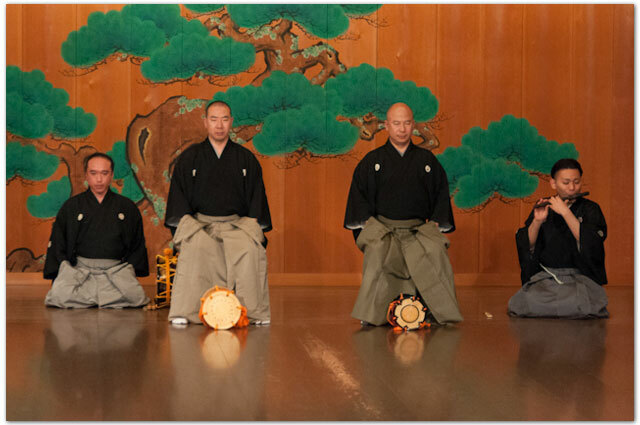 There is clearly a sharp division between the performer and the performed in the world of noh. 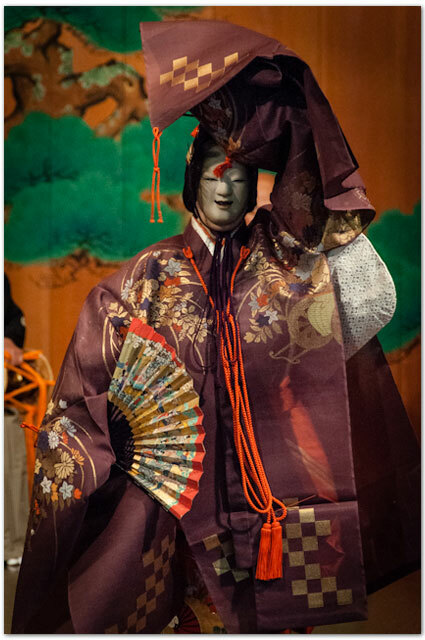 In September I will return to Fukuyama to join the chorus for Sesshoseki, in the meantime I will prepare for this summer’s “noh-travaganza” in Bloomsburg PA celebrating 20 years of the Noh Training Project with performances of Takasago and Hagoromo. This will be followed by another workshop production in the ongoing development in Deb Brevoort’s Blue Moon Over Memphis, Theatre Nohgaku’s paean to Elvis and lament on loneliness. 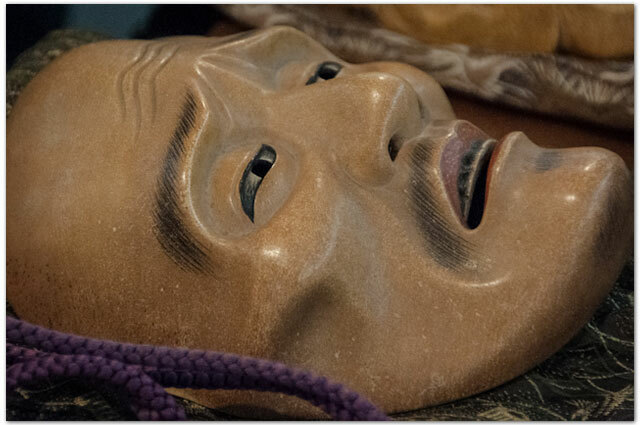 With the debut of Kitazawa Hideta’s mask and costumes by the artisans at the Sasaki Noh Costume Company, this next iteration should have the piece ready for touring. This entry was posted in Costume Workshop, Workshops and tagged 2014 costume workshop, bloomsburg pa, blue moon over memphis, dai-sho, examining details, fukuyama, hayashi, ji-gashira, kakegoe, kakitsubata, kaneko kyoichi, kikaigashima, matsui akira, nagashima shigeru, narita natsushi, Noh Training Project, omura sadamu, Oshima Kinue, Oshima Masanobu, richard emmert, sasaki noh robe, Sesshōseki, Shunkan, sugi shintaro, takigi noh, taniguchi masatoshi, theatre nohgkau, 大島, 佐々木能衣装. Bookmark the permalink. I really enjoyed this piece and find it inspiring. Thank you, John and Dave.